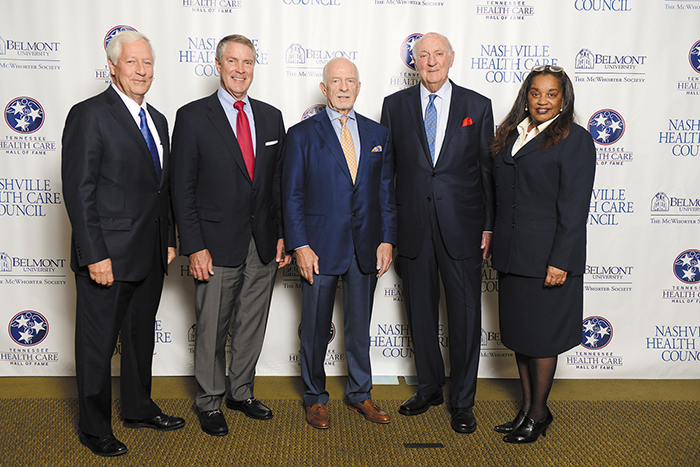 On Oct. 17, the Tennessee Health Care Hall of Fame recognized six industry luminaries - Dorothy Lavinia Brown, MD; Sen. William H. Frist, MD; Joel C. Gordon; Harry R. Jacobson, MD; Stanford Moore, PhD; and Donald P. Pinkel, MD - during a gala luncheon and induction ceremony held at Belmont University's Curb Center. The Class of 2017 represents a wide array of industry expertise from provider, researcher and educator to policymaker, investor and business innovator ... with the renowned honorees often filling multiple roles along the spectrum. Launched in 2015, the Tennessee Health Care Hall of Fame was created by Belmont University and The McWhorter Society with support from the Nashville Health Care Council to honor industry leaders with ties to the state. Emcee John M. Seigenthaler, respected broadcast journalist and senior counsel with Finn Partners, noted, "These healthcare pioneers have paved the way for Tennessee's presence on the national healthcare stage." Born in Philadelphia in 1919, Brown spent her youth in a New York orphanage. Graduating at the top of her class, she attended Bennett College before heading to Meharry Medical College in Nashville to pursue her lifelong dream of becoming a physician. Following internship at Harlem Hospital in New York, she was disappointed to be turned down for surgical residency based on race and gender. Calling Matthew Walker, MD, who served as Meharry's chief of surgery, her mentor offered her a faculty position back in Nashville despite advice from staff not to hire a woman. Not only did Brown hold that position for more than two decades, she became the first woman to practice general surgery in the South. 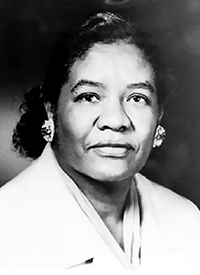 Brown went on to serve as chief of surgery at Nashville's Riverside Hospital and became the first African-American woman to be made a fellow of the American College of Surgeons. She was equally impactful in her personal life, becoming Tennessee's first single adoptive mother in 1956. A decade later, she became the first African-American woman to win a seat in the Tennessee Legislature. Throughout her life, Brown received numerous prestigious honors and was proud to serve as a role model "not because I have done so much, but to say to young people that it can be done." Accepting the award posthumously on her mother's behalf, Lola Brown noted her mother wasn't allowed to be born in a hospital and wasn't provided a birth certificate because she was black. "For someone who did not exist, she was able to change the face of medicine and the life of others." "I had the good luck to grow up in a medical family," said Frist. The Nashville native added one of his earliest and fondest memories was going on house calls with his father. Seeing the positive impact a physician could have on patients started his own journey of health, hope and healing. After undergraduate at Princeton and medical school at Harvard, the young physician continued his training, including a fellowship in cardiothoracic surgery at Stanford University School of Medicine. Returning to Nashville, he joined Vanderbilt University Medical Center where he founded the heart and lung transplant program and became founder and director of the Vanderbilt Multi-Organ Transplant Center. 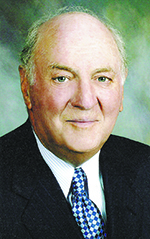 Throughout his career, Frist has performed more than 150 heart and lung transplants. In 1994, he was elected to the U.S. Senate and was chosen by his colleagues to serve as Senate Majority Leader in 2003. During his time in Washington, he led efforts to enact the 2003 Medicare Modernization Act and the historic PEPFAR legislation to address ... and help reverse ... the spread of HIV/AIDS worldwide. 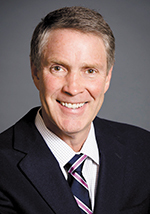 After completing his second term, Frist chose to return home to continue his hands-on work impacting population health. He founded the nonprofit Hope Through Healing Hands to improve the lives of citizens and communities around the world. More recently, he founded NashvilleHealth to convene conversations and build partnerships to align resources to improve the health and wellbeing of the city's residents. A partner and chairman of Cressey & Company's Executive Council, co-founder of palliative care company Aspire Health, and active member on numerous boards, Frist is widely recognized as a dedicated public servant and devoted humanitarian. After graduating with a degree in business from the University of Kentucky and spending three years as an officer in the U.S. Air Force stationed in Europe, Gordon began his business career in Tennessee in 1955 as a merchandise manager for Cain Sloan Company. Making the switch from retail to healthcare, he became known as an industry innovator. In 1969, he co-founded hospital management and operating company General Care Corp., which was later purchased by HCA. In 1982, he co-founded ambulatory surgery center company Surgical Care Affiliates, which was subsequently bought by HealthSouth. Gordon was also a key architect of HealthWise America, which was later acquired by United Healthcare. He was one of the first healthcare entrepreneurs to introduce the concept of physician ownership/joint ventures as a business model, an early pioneer of freestanding outpatient surgery centers, and one of the 10 original founders of the Nashville Health Care Council. "I didn't set out to be a pioneer," Gordon told the audience at the induction ceremony, "but early in my career, I recognized where disruption could improve healthcare." Gordon has received countless awards and honors for his work within the healthcare industry and the community, including the United Way's Alexis de Toqueville Award and Community Foundation's Joe Kraft Humanitarian of the Year Award. He continues to give back as a mentor to young entrepreneurs and marvels at the innovations coming out of Nashville. "We are the healthcare capital of the world, and we will continue to be at the forefront of change." Immigrating to the United States from Germany at age four, Jacobson grew up in Chicago and attended medical school at the University of Illinois. After training in medicine at Johns Hopkins and nephrology at Texas Southwestern in Dallas, he spent two years in the Army Medical Corp before embarking on a career focused on kidney disease and failure. Jacobson was recruited to Nashville to join the Vanderbilt faculty and grow the medical center's nephrology program, which has become a top 10 program in the nation. During this time, he also co-founded Renal Care Group, which grew into one of the world's largest dialysis companies. In 1997, Jacobson was named Vice Chancellor for Health Affairs at Vanderbilt and also served as CEO of Vanderbilt University Medical Center (VUMC). During his tenure, VUMC tripled revenues, moved into the top 10 programs nationally for National Institutes of Health research funding, and completed more than $1 billion in new facilities. His favorite achievement, he has said, was the creation of the Monroe Carell, Jr. Children's Hospital. After retiring from Vanderbilt, he co-founded TriStar Health Partners, which invests in transformative healthcare ventures across the industry spectrum. 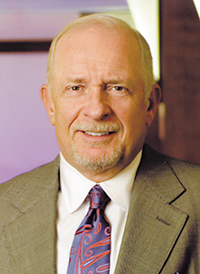 Jacobson has been a formal and informal advisor to a number of venture firms and healthcare boards and is a past chair of the Nashville Health Care Council. He is also an active mentor to those seeking to make an impact in healthcare. While Jacobson has been the recipient of many individual honors throughout his illustrious career, his emphasis has always been on creating a collegial culture where everyone has the opportunity to excel. "Certainly, healthcare is a team sport," Jacobson told the audience with a smile. Moore, who was honored posthumously, was born in Chicago in 1913 before moving to Nashville and graduating from the Peabody Demonstration School (now the University School of Nashville) and Vanderbilt University where his father was a law professor. He continued his education at the University of Wisconsin where Moore earned his doctorate in organic chemistry in 1938. 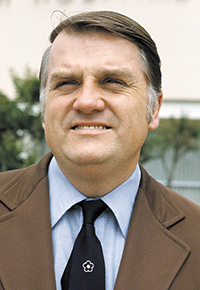 A highly accomplished scientist and professor, Moore developed many significant scientific breakthroughs, changing the way research was conducted. 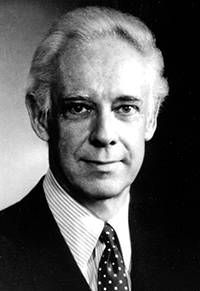 In 1949, he published the first method for the complete analysis of the amino acid composition of a protein, redesigned an automated amino acid sequencing system for ribonuclease, and contributed to the growing understanding of how protein functions on a structural and chemical basis. In 1972, he was awarded the Nobel Prize for Chemistry in recognition of his work, which changed the field of genetic medicine worldwide. The decorated scientist and life-long educator spent the majority of his career as a biochemist and professor at the Rockefeller Institute in New York. He is the namesake of Vanderbilt's recently completed residential Moore College and a recipient of the university's Founder's Medal. Accepting on his behalf, University School of Nashville Director Vincent Durnan, EdD, said Moore thought he would be an engineer before falling in love with chemistry. Durnan said Moore's legacy is not only his prolific body of research but also the collaborative spirit with which he engaged his colleagues and others to improve scientific understanding to ultimately drive outcomes. Pinkel, the first Director and CEO of St. Jude Children's Research Hospital, hailed from Buffalo, New York. Joining the U.S. Navy in 1944, he was sent to Cornell University as a pre-med officer candidate before graduating from the University of Buffalo School of Medicine in 1951. While in med school, Pinkel developed an interest in hematology and started a clinic for young hematology-oncology patients while a pediatric resident at Buffalo Children's Hospital. Soon after, he was recalled to active service during the Korean War. Contracting paralytic poliomyelitis, Pinkel worked with the renowned Sidney Farber, MD, at Boston Children's Jimmy Fund Clinic during his rehabilitation. Pinkel was then recruited to develop pediatric service at Roswell Park Cancer Center in Buffalo before being enticed to Memphis to work with a new facility - still under construction - that would focus on the research and management of childhood malignancies and blood disorders. "Our success at St. Jude is due in large part to our first medical director ... and our first employee ... Dr. Pinkel," said Virgil Holder, director of the St. Jude Liaison Office who accepted on the physician's behalf. Pinkel oversaw the hospital's rise to international prominence in pediatric hematology and oncology research and treatment over the next 11 years. He left the hospital in 1974, going on to develop pediatric oncology programs at hospitals across the nation before retiring to California in 2001. For many years after, he continued to teach in the Biology Department of Cal Poly State University. Holder said Pinkel's legacy at St. Jude is still very much in evidence. "He developed the collaborative model that still fuels our progress today."